Reference number for this case: 7-sep-54-Harponville. Thank you for including this reference number in any correspondence with me regarding this case. GENDARMERIE OF THE 2 ° R.M. on the appearance of a "flying saucer"
Reference: article 78 and 87 of the Decree of May 20, 1903. On 7 September 1954, around 7:30 a.m., two people on a bicycle report having seen a flying saucer between HARPONVILLE and CONTAY. Around 7 hours 30' circulating on the C.G. 47 between HARPONVILLE and CONTAY, these two people had their attention attracted by a strange-shaped machine. It was a large cylinder 10 meters in diameter and 3 meters high, the upper surface was curved and a door was visible on the vertical wall. This device that was posed in a field 200 meters from the road took off when the two abovementioned men approached it. This climb was done first on about fifteen meters in oblique then vertically. No sound was heard but a pipe under the device let out blue smoke. The machine remained 4 to 5 minutes at the sight of the 2 reporters. The Section Commander who interviewed the two witnesses believes that it is not a matter of mystifiers. They declare, moreover, without false shame, that they had been very frightened. The gendarmerie went to the place with the police dog BOBBI. The spot where the machine was located according to the witnesses is located 800 meters N.W. of C.D.47, at 1 Km 800 of CONTAY and 4 Km 800 of VARENNES. No trace exists on the soil composed partly of grass and partly of alfalfa. The dog did not follow any trail. This report is prepared for all purposes and with all reservations. Mr. the Head of Air Security Service CAMBRAI. "Today, September 7, 1954, around 7 o'clock or 7 o'clock 30 in the morning, I was traveling by road from my home to La Houssoye where I worked when between ARPONVILLE [sic] and CONTAY, in the plain, 150 meters from the road, my attention was attracted by the bizarre shape of a haystack with the particularity of an oscillating movement. After pointing this out to my workman [...] with him I approached this object to better look at it. I had arrived at a hundred meters when it took off, first at fifteen meters on a rather slow oblique ascent, then vertically a lot faster and disappear to my sight in the sky. This is a gray cylinder of train wagon color whose upper surface is slightly domed. I saw arounf it a form of door and below a pipe through which escaped smoke during the ascent. The dimensions are in my opinion the following: diameter about ten meters, height 2 meters 50 to 3 meters. During the ascent of this object I noticed that the smoke exhaust to the exclusion of any sign of light or sound, the device made absolutely no noise. Having read, I persists and sign. I left ACHEUX at 7 am to reach la HOUSSOYE where I work as a mason. I was accompanied by my boss, Monsieur [...]; on a bicycle we took C.D. 47 by HARPONVILLE. Between this locality and the commune of CONTAY, on our right, in a field stripped of harvest and about 150 meters from the road, we saw an uncovered haystack. The latter had the appearance of a water tower sump. We found this haystack very weird and we stopped to watch it. It may have been about ten meters in diameter by about three meters high. It seemed to me that there was an opening wider than it was high for what we took for a haystack and which in reality was not. It was a machine. The latter began to rise in the air slowly and without any noise. By climbing the craft allowed us to discover like a tailpipe from which came out a sparse gray-blue smoke. The craft had a dirty color, either black or dark blue. The smoke was visible until the craft reached ten meters. This machine took altitude obliquely. After a height of about 12 meters, it climbed vertically and it seemed to me that it was gaining speed. It disappeared in the air about five minutes after its climb. I informed about these facts of the guard of la HOUSSOYE, who informed you. My boss and I did not approach the place as our surprise was great. The place from where the machine left is located near a wood. I did not see anyone near the craft." Having read, I persist and sign. on the appearance of a "flying saucer". The facts were set out in the report cited in reference. On September 7, 1954, around 7:30 am, two cyclists going to work circulate on G.C. 47 between HARPONVILLE and CONTAY. They see a craft of circular shape (diameter 10 meters approximately) height 2 m. 50 to 3 m.) 200 meters from the road. This craft has a swinging motion. No noise is heard. The 2 men approach within 100 meters. The craft then rises in 2 steps: at first a rather slow climb oblique up to an altitude of approximately 15 meters, then a vertical climb to disappear at the sight. Both people had the machine under the eyes for 4 to 5 minutes. This is not a fleeting vision. The two witnesses immediately went to the CORBIE Gendarmerie Brigade (the closest to their place of work LA HOUSSOYE) from where they were immediately taken to the Amiens Section. Upon arrival at AMIENS, the two men are interviewed separately and simultaneously in two offices. Their statements are identical. Excellent morality and mentality. Was chosen to occupy at the mobilization an auxiliary job in the Republican Guard. Very well known to the local brigade. 2°) - [...], 23 years - [...] worker very well known to the brigade. It is therefore two men, having a good view, sane and sober. They will lose the pay of a day's work. To avoid any suspicion of drunkenness or fatigue, the schedule of witnesses was verified by the Commanding Officer. They went to bed the previous evening around 9 p.m. and got up around 6 a.m.; They left ACHEUX around 7 a.m., after having lunch, to go to work at LA HOUSSOYE. They did not stop along the way to consume [alcohol]. They are therefore well disposed and are not intoxicated. Gentlemen [...] and [...] were taken to the place, with the Commander of Company twelve officers and gendarmes and dog BOBBI. Location: 200 m. North West of C. D. 47 - 1 km 800 from CONTAY and 4 km 800 from VARENNES. Soil: partly covered with alfalfa and herbs. Visibility: September 7th at 7 a.m. 30, it is daylight, the weather is clear and without fog. At the question of the Company Commander, Mr. [...] said that it is not a helicopter because he has already seen these craft closely. The craft was not seen by the inhabitants of CONTAY-TOUTESCOURT HARPONVILLE - HERISSANT - VADENCOURT, localities surrounding the place. - Consulted, LUCHEUX Radar Master Station 15 km away, in straight line, was not in action at 7 a.m. 30. It cannot provide any indication. Gentlemen [...] and [...] are two serious men; the visibility is perfect. The Company Commander is convinced that these people have actually seen a "craft". The local press, alerted by the public rumor, sent journalists on the spot. They have the same conviction as the Commander of the Company. It is not possible to say that this machine is what is commonly called "Flying Saucer". Another "flying saucer" case occurred in the Péronnaise region, the gendarmerie easily demonstrated that it was a hoax. That, is the news which came to us at the end of Tuesday afternoon, news which the witnesses of the amazing event confirmed to us. This information will certainly generate a perfectly comprehensible skepticism, but the two men who "saw" the machine gave us concordant statements on all matters. So, on Tuesday morning, M. Emile Renard, 27, a masonry craftsman living on the Doullens road in Acheux-en-Amienois, had left his home by bicycle to go to work at Lahoussoye. He was accompanied by his helper, M. Yves de Gillaboz, aged 23, living on the Bertrancourt road in Acheux-en-Amiénois. They both rode along normally, when at about 7:15 A.M., at which time they had passed through Harponville and were going towards Contay, their attention was caught by a large machine sitting in a recently mowed field, about 200 meters and to their right. - One might have taken it for an unfinished haystack", M. Renard told us, whom we found in the presence of his family in the course of the evening. Yes, and the top was a bit rounded, looking like a plate upside down, added Mr. de Gillaboz, whose boss had fetched from his home at our request. Puzzled, the two men jumped off their machines, and ran into the fields toward the apparatus. Renard, being faster than his companion, distanced him by a good bit. - As I approached, he told us, I kept my eyes on the object. Thus I could perceive that it was of a dirty grey color, and was possibly, some ten meters in diameter. - It was wobbling a bit, M. de Gillaboz specifies. - Did you hear any sound? we asked. - Absolutely not, both men replied. And both specified that they noticed on the side of the craft a sort of door wider than it was high, but closed. - I had run about 50 meters, said Mr. Renard, when I saw that the apparatus was rising diagonally, while a smoke escaped from a sort of pipe in its lower portion. In this manner it reached an altitude of about 15 meters. Then it quit the diagonal travel and rose vertically and faster. We followed it with our eyes for several minutes. The higher it rose, the more difficult it was to see it, and it finally disappeared. - What were your feelings, at that moment? we asked. - What would you expect? replied M. Renard, we just stood there with our mouths open. - As for myself, I wanted to do just one thing: get on my bicycle and get out of here as fast as possible. - I just like froze, added the master mason. I asked myself what phenomenon we just witnessed, then it occurred to me that perhaps it was a flying saucer like those the newspapers have been telling about. - Think about it, remarked his companion, we just couldn't accept it. You've got to admit there's some reason to be flabbergasted when you see something like that. - I wanted to know what it was because I was utterly puzzled by it. I can't say whether I would have dared to touch it, but perhaps I would have tried to see what was inside. How? I really don't know. During their statement the two men made a strong impression of sincerity. They said that when they had spoken of what they had seen to people in Lahoussoye, the police were called. In the course of the day MM. Renard and de Gillaboz were interrogated separately at great length. They were taken back to the place where they saw the machine. No trace of it could be found on the ground. At the police station, a complete silence on the subject is being observed; it seems as though they are reluctant either to confirm or deny what remains a mystery to everyone. However, the testimony of the two men is straightforward and precise, so we are presenting it to our readers just as they told it to us. Amiens 8 (A.C.P.). - It appears from the testimony of two workers that a mysterious machine flew Tuesday morning from a field bordering the road linking Harponville to Contay in the Somme. Mr. Emile Renard, a 27-year-old artisanal mason living on the road from Doullens to Acheux-en-Amiénois, was accompanied by his workman, Mr. Vves de Gillaboz, 23, who had left his home on bicycle to go to work at La Houssoye, remaining road of Bertrancourt, also in Acheux. "It looked like an unfinished millstone," they said, and the slightly rounded top resembled a flattened plate. Intrigued, the two men jumped down of their machine and ran into the fields towards the gray craft, which might have been about ten meters in diameter. It oscillated somewhat, but made no noise, and on its wall one distinguished a kind of door wider than high, which was closed. "However," said Mr. Renard, "as I was before my companion, I had traveled about fifty yards, I saw the apparatus rising diagonally, while a smoke escaped through a kind of pipe placed in its lower part, and then at a height of about ten meters, the machine continued to ascend vertically and more rapidly." It ended by disappearing from the eyes of the two men, who, awestruck, wondered what phenonen they had just witnessed. At the gendarmerie of Acheux-en-Amienois, where they were long and separately questioned, one keeps the most complete silence, being careful not to inform or to confirm what remains for all a mystery. MM. Renard and Gillaboz were also taken to the spot where they would have seen the aircraft. But there was no trace on the ground. ARRAS. - Two masons, MM. Emile Renard, 27, and Yves de Gillaboz, domiciled in Acheux-en-Amiénois (the Somme), said they observed a "flying saucer" at the exit of the village of Harponville. "The thing, they said, was in a field, 200 meters from the road. It looked like a huge upturned plate, was gray, and measured ten meters. We dropped our bikes and we started to run in the direction of the machine which was sometimes leaning left, sometimes leaning to the right. On the surface a kind of wider than high door could be seen, and carefully closed. "While we were still a hundred meters of the saucer, the latter began to rise obliquely, without noise, letting an acrid smoke escape through a tube placed below. Having reached 15 meters height, this weird machine rose in a straight line rather quickly and eventually disappeared. We believed we were dreaming..."
The two men, interviewed separately by the police, provided the same report of what they claim to have seen. "The flying saucer takes off at the speed of a helicopter then the acceleration becomes vertiginous"
Amiens, September 14. -- Yesterday we presented, the extraordinary report by Mr. Marius Dewilde, of Quarouble, close to Valenciennes, who stats he saw a flying saucer and two small mysterious beings. This scene, let us recall, occurred Friday, September 10, towards 23:15. Today hereis the story of two resident of Acheux-in-Amienois, misters Emile Renard and Yves de Gillaboz, who, as we had specified briefly, also claim to have seen a flying saucer. This adventure, which occurred 90 km in straight line from Valenciennes, happened on Tuesday, September 7, towards 7:15 a.m. The craft seemed stopped at a few centimetres of the ground, in a thatch, within 200 meters of the secondary road which goes from Harponville to Contay. Mr. Emile Renard is 27 years old, he is owner mason, married and father of four children. Native of Acheux, we weree told by everyone that he is a keen worker. And is the first to express his impatience about the flying saucer. "For one week, he told us, I waste half of my days to tell this story. I have enough of that, believe me. That's not what puts food on the table for my children." As of Yves de Gillerboz, he worked as mason with Mr. Renard for one year. He is a strong 23 years old boy, showing health and which, no more than his boss, seems to want to joke around. We interrogated them and their accounts agree perfectly, just like the whole agrees on many points with the Mr. Dewilde's vision. "Instead of using the van whose engine needed repair, Mr. Renard explained to us, my employee and I had left on bicycles to return to our work at the rural policeman's of the commune of Houssoye. Suddenly between Harponville and Contay, the tire of Guillerboz' bicycle deflated. I stopped to hand my pump to him and my eyes were attracted by a kind of disc, within 250 meters of us in a field. - Look, I told my friend, that's a haystack with a funny color! But very buzy inflating the tire, he did not answer me. Puzzled, I continued to detail the object when I realized that the latter, while moving compared to the ground, was shaken by a slight swinging, a kind of oscillation around an imaginary axis. - But look at that, looks at that, it is not a haystack! I shouted to companion. And both of us, taken by I do not know what presentiment, we rushed through the fields to approach the mysterious apparatus; we had to cross, after a first waste land, a beet field. Hardly had we started to run through the latter that the saucer, for it was now a saucer to us, we were sure, takes off askew during about fifteen meters to then go up vertically." Just like his boss, Mr. Guillerboz, specified to us that the machine was ten meters in width by three meters high approximately. "It was of a bluish gray color but did not shine", he specified to us. Both finally, affirm that the saucer left without making the least noise. Contrary to Mr. Dewilde, of Quarouble, they did not succeed in approaching the machine at less than 150 meters. But according to these witnesses, this saucer there too, had at its back a kind of tailpipe where smoke came out at the time of takeoff. Very disturbed by this vision which had lasted at least three minutes, for the machine took some time before disappearing in the clouds, Misters Renard and Guillerboz told their adventure to the forest keeper of Houssaye. It is the latter who insisted that the statement is made to the gendarmerie of Corbie. The gendarmes came on the spot as well as a specialists in aeronautics. They lengthily investigated but no trace of the passage of the saucer was found in the field. Perhaps it did not land but hovered like a helicopter. Lastly, the last comparison item between the saucer of Quarouble and that of Acheux-in-Amiénois, the takeoff was achieved initially askew and then vertically. At the start, during the first meters, the witnesses agree to specify that the rise was done about at the same speed as that of a helicopter. It is thereafter that acceleration becomes vertiginous. DESCRIBING SAUCER TAKE-OFF from field near Amiens, Yves de Gillaboz (left), Emile Renard point to the sky where they saw the Martian machine" belching puffs of smoke as it disappeared from view. Amiens. 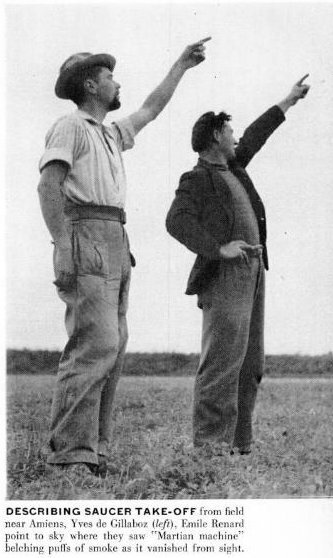 -- Yves de Gillaboz (left) and Emile Renard point out the direction taken by the flying saucer which they caught landing. While going to work, in a roadside field they saw a big cupola, shaped like an inverted deep dish. They ran toward it. They could easily perceive its color, "dirty grey", they declare, and its dimensions, 10 meters by 3. It was oscillating on its base, but was emitting no sound. On the surface appeared a closed door, which was wider than it was high. Before they were able to get close to it, the machine rose diagonally, a thick black smoke escaping from a pipe on its underside. It climbed then to a height of 15 meters, then rose vertically, at a noticeably increasing speed. The two men, in awe, followed it for a moment with their eyes. The police, on being notified, found no suspicious marks at the indicated place. But the seriousness of the two men was beyond doubt. Moreover, Mr. Chovel and his family, near Hirson, saw during the night time a luminous disc resembling the Amiens saucer. 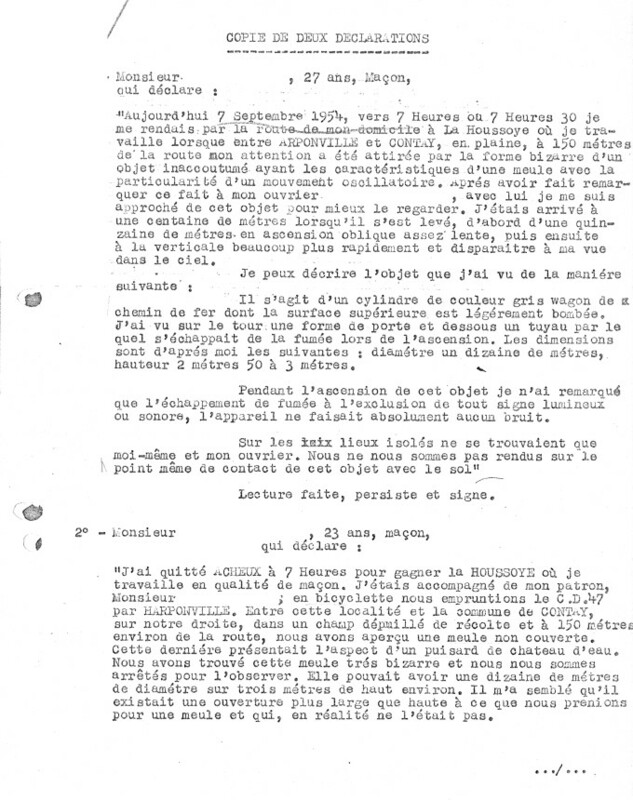 A 27-year-old mason and his assistant report that recently (on September 7, see below) they saw a grey object resembling a truncated millstone with a large inverted plate lying on it in a field at about 200 meters from the road where they were driving, near Acheux-en-Amiénois, Somme Department. The object oscillated slowly, and seemed to have a closed door on its side. When the men had run about 50 meters toward it, the object began to fly away. Smoke was then visible from a sort of exhaust pipe on the underside. After an oblique flight of about 15 meters, the object rose vertically and disappeared. Police later found no trace of the object. Emile Renard, a Mason, and Yves de Guillerboz, his assistant, saw what they considered to be a "flying saucer" at 0:15 on 7 September. Both men are known to be very reliable. They stated that the object apparently never touched the ground, but hovered above the ground like a helicopter. It was about 10 meters in diameter and 3 meters in height. did not glow, and departed noiselessly, trailing smoke as it took off. They saw the object for at least 3 minutes. DESCRIBING SAUCER TAKE-OFF from field near Amiens, Yves de Gillaboz (left), Emile Renard point to the sky where they saw "Martian machine" belching piuffs of smoke as it vanished from sight. The author indicates that from a village fifty miles from Lille, a report was telegraphed, saying that Emile Renard, a builder, and Yves de Guillerboz, his foreman, had been cycling home along a country lane, when glancing at a stubble field, they saw a strange object parked among the oats. "I do not frequent bistros or estaminets, but I tell you we saw, on the field, a metal disc, blue grey, thirty feet long, and nine feet high. It took off at the speed of a helicopter and smoke came from its rear. It made no noise and vanished into the clouds." The author indicates that on August 8, 1954, close to Acheux-en-Amiénois, the mason Emile Renard and his workman Yves Degillabez saw a saucer posed in a field. They ran in direction of the apparatus whose shaped reminded of "a truncated haystack covered with a huge plate turned upside down." The apparatus oscillated slightly, proof that it was not posed, and on his wall "one distinguished a 'door'." When the men approached, smoke escaped from the lower part of the saucer and it then started its flight and disappeared. The gendarmes who opened an investigation noted no trace at the place indicated by the two masons, a detail which is nothing surprising owing to the fact that the apparatus did not rest on the ground but "oscillated slightly." Emile Renard, mason, aged 27, and his workman Yves Gillabez, aged 23, affirmed to have seen seen in a field ar approximately 200 meters of the road near Acheux-in-Amiénois a craft resembling a truncated haystack covered of a plate turned upside down. The two men jumped off their bicycles and ran in direction of the craft of gray color, ten meters of diamtre approximately, which oscillated slightly and on which a kind of closed hatchway could be seen. "However, whereas preceding my companion, I had crossed about fifty meters, I saw the craft rise in diagonal, while a smoke escaped by a kind of 'pipe' placed on its lower part. Then, at about fifteen meters height, the craft continued its ascencion vertically and disappeared quickly. Yves and I, we thought we were dreaming!" The two men were interrogated separately by the Gendarmerie of Acheux-in-Amiénois and made exactly the same report and gave the same details. The gendarmes were astonished not to discover any trace on the location, but that is normal since the witnesses specified that the apparatus oscillated slightly, which obviously proves that it did not touch the ground. Numerous residents of the district of Peronne reported that they had seen at the same hour as that indicated by the two witnesses a craft of exactly identical description above the wood of Foucancourt-in-Santerre. Aimé Michel notes that on September 7, 1954, at about 7:15 A.M., two masons of Acheux-en-Amiénois, Mr. Emile Renard, aged 27, and his workman Yves Degillerboz, aged 23, went to their work riding bicycles and were between Harponville and Contay on the secondary road Route Départementale 47 when they lived a strange encounter. 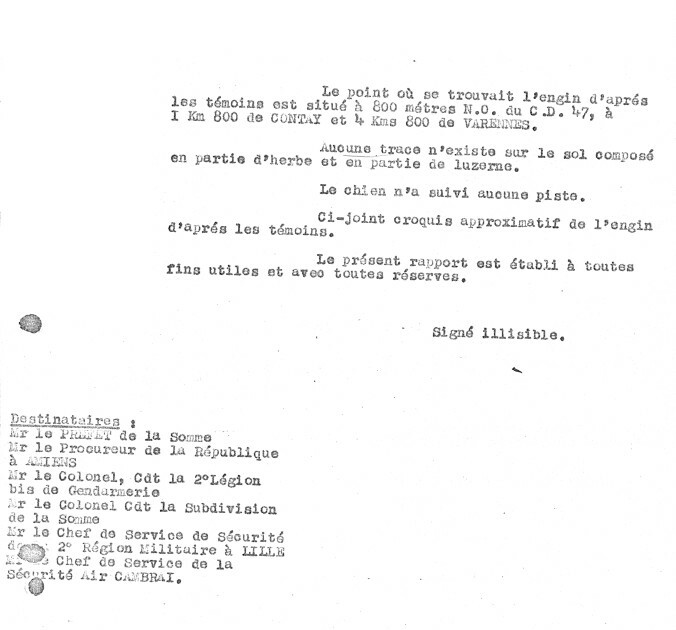 Aimé Michel provides the following account like resulting from the statement to the Gendarmerie (police attached to the Army), which questioned the two men separately, as did the military authorities, which all indicated that the accounts of the two men confirmed each other in all the reported details. "Instead of taking the van as usual, as its engine was under revision, my workman and I took the bicycles. We were to go to work at the pastoral guard of the community of Lahoussoye. Suddenly, between Harponville and Contay, a tire of Degillerboz' bicycle deflated. I stopped to lend him my pump, and my eyes were attracted by a sort of disc, within 200 meters from us, in a field. You would have thought it was an unfinished haystack, whose top would have been capped by a plate turned upside down." "- Look at this, I said to my workman, don't you find that this haystack has a strange color?" "Puzzled, I examined the object, when I realized that it slightly moved with a hardly perceptible swinging, like an oscillation." "But looks at it! Look at it please! It is not a haystack! I shouted at my companion." "Then, we both rushed through fields towards the mysterious object. To reach it, we had to cross a waste land, then a beet field. Hardly had we reached this field that the object took off in skew, slipping by in diagonal on about fifteen meters, then started to go up vertically. Maybe, overall, the vision lasted three minutes, after that the object disappeared in the clouds." "The object flew away without noise, while releasing on it right below, a small puff of smoke. It was of a gray-bluish color. It could have had ten meters in diameter, and three meters height approximately, and, as I said, it resembled a plate turned upside down. On the left, at the bottom, a sort of plate, broader than high, as a door, was observed. It was at approximately 150 meters of us when it took off. It is the rural guard of Lahoussoye who insisted that we report our observation to the gendarmerie of Corbie." Aimé Michel indicates that after having received the witnesses statements, Gendarmes and specialists in aeronautics, that he says were the military authorities of the city of Amiens, went on the premises where they did not find any traces other than those of the two witnesses. Aimé Michel notes that as the object oscillated, it was to be above ground-level and did not land, which is consistent with the absence of traces. Aimé Michel indicates that the official investigation, not being able neither to prove nor to disprove a prank - the two men knowing each other well - produced no result and the case was thus closed. The author reports that on September 7, 1954, at 07:15 a.m., in broad daylight since the sun rose at 05:15 a.m., Mr. Emile Renard, aged 27, and his companion Yves Degillerboz, aged 23, mason, were riding their bicycle on the road between Harponville and Contay in the département of Somme, to go to the building site where they worked. Mr. Degillerboz suddenly realized that one of its tire was deflated. The two cyclists thus stopped and while Mr. Degillerboz was busy to reinflate the tire, Mr. Renard idly looked at the landscape. "My eyes were drawn to a kind of disc, at 250 meters of us, in a field. 'Looks at this,' I said to by co-worker, here is a haystack which has a funny color!" All occupied at inflating, he did not answer me. 'But please looks at this, look at this, it is not a haystack!' I shouted at with my companion. And both, under I do not know which sense of urgency, we rushed through the field to approach the mysterious machine. We had to cross a first waste land, a field of beets. Hardly did we start to run through that, that the saucer, (because now, to us, it was certain, it was a saucer), took off in skew during about fifteen meters and then went up then vertically." Michel Carrouges indicates that the account of Mr. Renard is confirmed by Mr. Degillerboz, and that the latter adds that the machine was gray bluish and must have been about ten meters wide for approximately three meters in height. Michel Carrouges reports that the two men spoke about their meeting only to the rural guard to which they went, and that it is this pastoral-guard which insisted that they must report with the gendarmerie of Corbies. 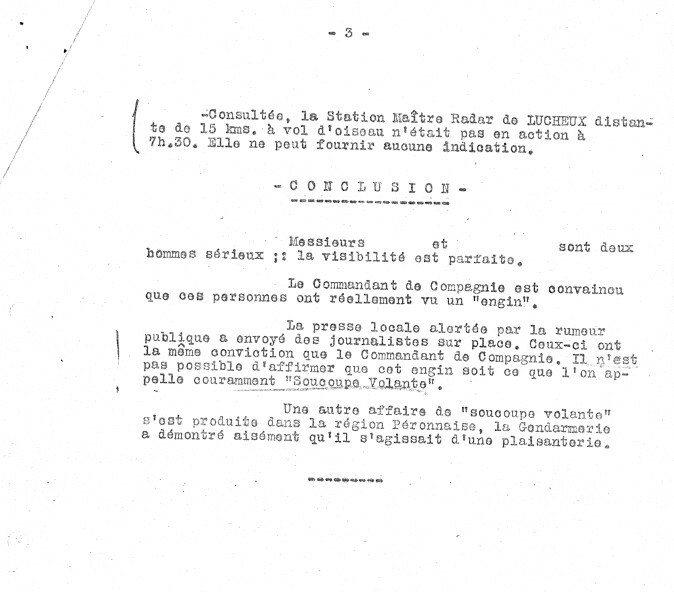 Citing Aimé Michel, Carrouges notes that the gendarmes as well as the journalist noted that the two witnesses were annoyed by a publicity which they had not sought and which they tried to espace. Carrouges points out the important aspect in this case as in many othersm that of traditional "successive assumptions" in which the witness does not think firsthand that he sees a saucer as if he were conditioned to see some, but starts by interpreting what he sees at the beginning as something of commonplace nature, a haystack in this case, before having to give up the commonplace interpretation after a better or nearer glance, and of course after the fact that the "haystack" flies away in this case. Carrouges also notes that at the time of the takeoff of the machine the witnesses are with 150 meters of him, and that at this distance, as he checked by looking at similarly distant cars, one can accurately realize the color of an object having this sort of proportions. 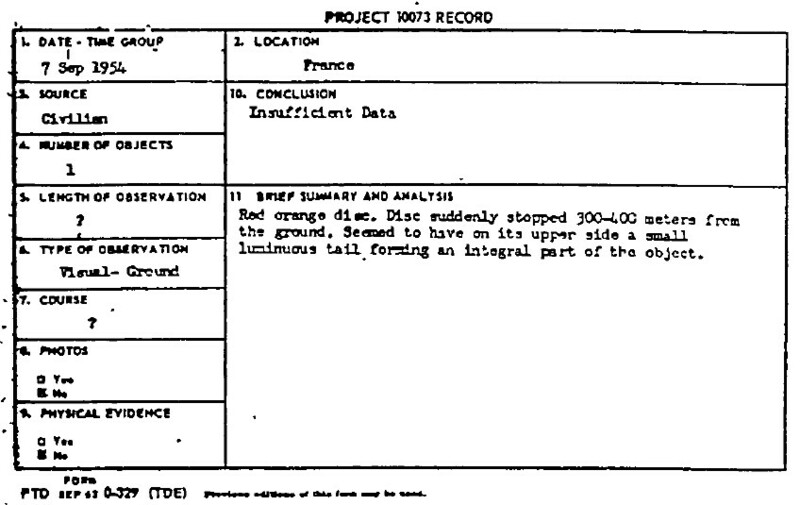 Carrouges evokes the theory that saucer reports are sometimes caused by landed helicopters, but indicates that on the one hand the departure was quiet and on the other hand, "noboby reported the least helicopter as having landed at the indicated place." My eyes were caught by a sort of mound, two hundred yards away in a field. It looked something like an unfinished haystack, with an upside-down plate on top. "That's a queer color for a haystack," I said to Yves, "look at it." All of a sudden I noticed that the haystack was moving a little, with a slight swing back and forth, like an oscillation. We both rushed toward the mysterious object. When we got close the object took off on a slant, traveled diagonally upward for about fifty feet and then began to go straight up. We watched it for three minutes. The object was about thirty feet in diameter. "It resembled an unfinished haystack, with a plate turned upside down at the top." Vallée indicates that when the men approached, the object flew away. Sep. 07, 1954 07:15 Harponville (France). Between Harponville and Contay, two bricklayers, Emile Renard, 27, and Yves Degillerboz, 23 saw an object floating in mid-air over a field: "It looked like an unfinished haystack, with a plate turned upside down on top of it." When they approached, it took off. Diameter 10 m, height 3 m. A kind of door was noticed. The observation lasted over 3 min. The object released smoke when it departed. (6; M 35) (Le Figaro, September 9, 1954). September 7, 1954, 07:15, Harponville (France). Between Harponville and Contay, two bricklayers, Emile Renard, 27, and Yves Degillerboz, 23 saw an object floating in mid-air over a field: "It looked like an unfinished haystack, with a plate turned upside down on top of it." When they approached, it took off. Diameter 10 m, height 3 m. A kind of door was noticed. The observation lasted over 3 min. The object released smoke when it departed. (6; M 35) (Le Figaro, September 9, 1954). The two authors, journalists and ufologists, indicate that on September 7, 1954, at about 07:15 in the morning in the department of the Somme, two masons of Acheux-in-Amienois, Emile Renard, aged 27, and his colleague workman Yves Degillerboz, aged 23, were going to a building site in Lahoussoye. They rode on bicycles on the Secondary Road 47 because the van which they usually used was under revision. Whereas they were between Harponville and Contay, Yves Degillerboz had to stop because one of the tires of his bicycle had deflated. Emile Renard put foot at ground also, to lend his pump to his comrade. "Within two hundred meters of us, I saw, in a field, something which puzzled me. It resembled an unfinished, and capped haystack topped with a kind of plate turned upside down. While staring at this thing, I realized that it slightly moved with an unperceivable swinging. I uttered an exclamation of surprise. Yves stood up. He saw it, too. We started to run towards this mysterious object. We had to cross a wasteland, then a beet field. At the time when we reached it, the machine took off in oblique, on about fifteen meters, then it climbed vertically and disappeared in the clouds. No noise. There was like a small trail of smoke." The two men had time to observe the machine well, of which they were not any more than with 150 meters away approximately when it rose from the ground. They made a rather good description of it to the gendarmes, which the authors note as follows: a disc, or more exactly a kind of reversed plate, color gray-bluish, some ten meters in diameter and 3 meters height approximately. On the left of the lower part, they believed to see a kind of door. The authors indicate that the testimony of the two masons was largely confirmed by many others which, in a radius of 15 kilometers, reported at this same time the overflight of the area of Péronne by an object identical in all manner. The two authors indicate that they were refer to the report by the gendarmerie and their personal file as source. The two authors indicate that on September 7, 1954, at 7:15, between Harponville and Contay, Emile Renard, masonry craftsman, aged 27, residing in Acheux-in-Amiénois and Yves de Gillaboz, aged 23, mason, were going to their workplace when they saw in a field within 200 meters of the secondary road a disc like a haystack or "a turned over plate of some ten meters in diameter oscillating around an imaginary axis." One distinguished on his wall a kind of closed door, broader than high. The craft rose in diagonal with a smoke which escapes by a kind of pipe on its lower part. At about fifteen meters of altitude the object started a faster vertical rise and disappeared. They note that the gendarmerie squad of Acheux-en-Amiénois told them by a letter of April 3, 1976 to have never investigated into this case, as opposed to what the newspapers of the time had written, and that the brigade of Corbie gave the same answer. They indicate as source the newspapers La Montagne in September 1954, Le Parisien Libéré for September 9, 1954 and October 14, 1954, Le Figaro and Nice-Matin for September 9, 1954, Vallée's catalogue and the books of Michel Carrouges and Aimé Michel. 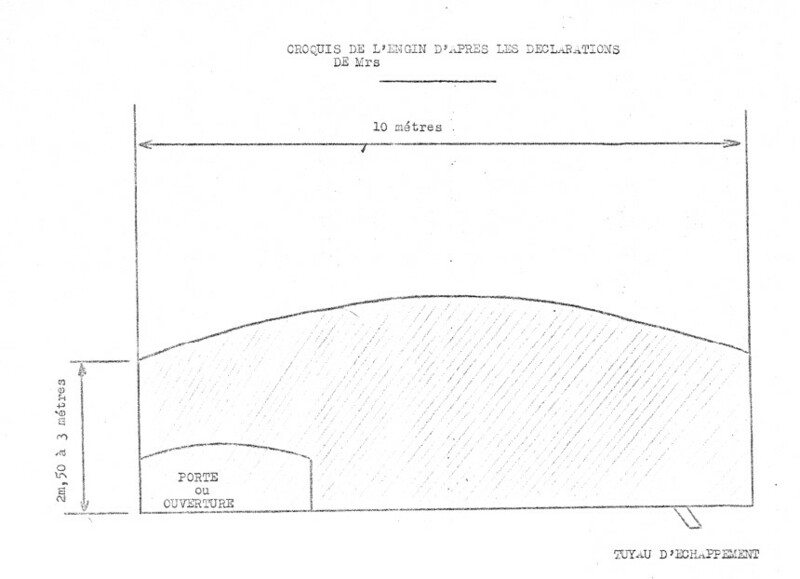 Dominique Caudron indicates that in Harponville in the Somme on September 7, 1954 a saucer performed a near-landing, and comments on - by irony - "This time it's, 'they' land on our premises". "Suddenly, between Harponville and Contay, Degillerboz's bicycle had a flat. I stopped to lend him my pump and my eyes were attracted to a sort of disc about 200 meters from us in a field. "Intrigued, I was examining the object when suddenly it moved with a slight swinging oscillation. '"But look! Look there! It isn't a haystack,' I cried to my companion. "Then we ran across the field toward the mysterious object. In order to reach it we had to cross a piece of fallow land and a field of beets. We had hardly reached this last than the object came up obliquely, went on this way diagonally for about 15 meters, then started to go up vertically. "All in all this vision lasted perhaps three minutes, after which the object disappeared in the clouds. 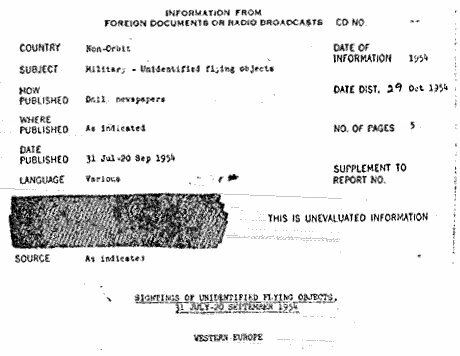 "The object flew off without noise and emitted on the lower right a little smoke. It could have been about 10 meters in diameter by three meters high and resembled an overturned plate. On the left, below, one could see a sort of plaque which was longer than it was high, like a door. It was about 150 meters from us at the moment of its ascent. "The Constable of La Houssaye insisted that we report our observations to the Constabulary of Corbie." 38. After hearing the men out, the Constable checked the area of the sight ing finding the footprints of Renard and Degillerboz in the soft dirt but no trace of a landing by the supposed machine. Since the two witnesses were good friends, the officer of the law assumed the story was a practical joke. Later critics of the lawman's judgement suggested that since the UFO was quivering when first spotted, perhaps it never actually touched down. 39. Word of this report did reach the offices of BLUE BOOK, one of the few European cases to do so, but when and by what means is not known. Judging by the scanty data obtained case project record card below, the sole bit of paper on the incident), the source must not have been a good one. 38. Paris, France. Le Parisien Libere. 9 September 54. p.7. Also: Paris, France. Figaro. 9 October 54" Also: Paris, France. France-Soir. 9 October ST.
39. Michel, Aime. "Flying Saucers in Europe." Fate. Vol.11, No.l. January 1958. p.33. The Belgian ufologist indicates that in 1954, on September 7 en France in Acheux en Amiénois - Harponville - Contay, "Emile Renard, mason and Yves Degillerboz his workman, both by bicycle, saw at 07:15 of the morning, a saucer posed in a field, whose form rsembled a truncated haystack covered with an immense plate turned over. The apparatus oscillated slightly. Whereas the witnesses approached a smoke escaped from the lower part of the machine which took its take-off and disappeared. The gendarmerie investigated." The sources are indicated as "Jimmy GUIEU: 'Black-out sur les S.V.' - Fleuve Noir 1956 - p. 79 et 123 - il cite deux dates (dont le 8.8.54) à des endroits différents pour le même cas" et "Jacques Vallée: "Chronique des apparitions ET" - DENOEL 1972 - COLL. J'AI LU - p. 257)". "Suddenly Degillerboz realized that one of his tires was deflated. The two men stop and while Degillerboz is busy reinflating his tire, Renard looks ildly automatically a the landscape (etc...) And both, taken by I do not know which presentiment, we rushed through the fields to approach the mysterious l’engin (...) took off in skew during about fifteen meters to go up vertically then". 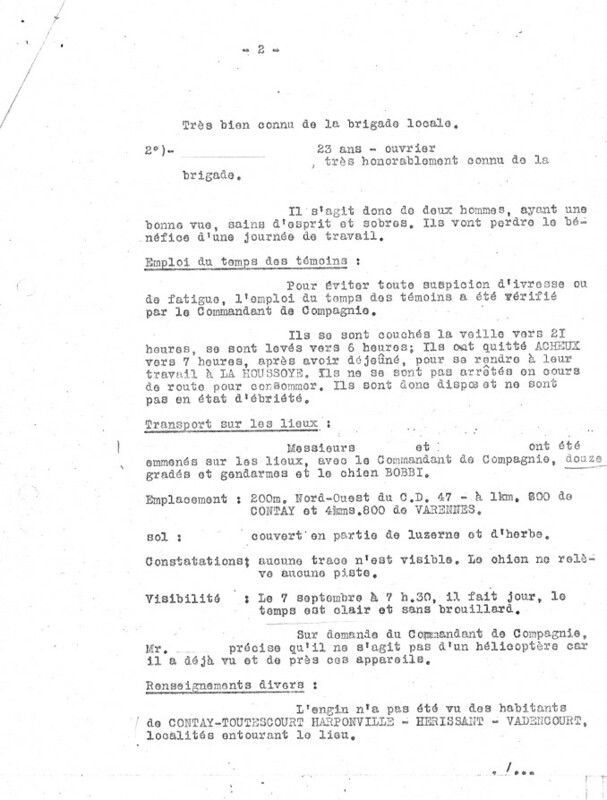 The sources are indicated as "Parisien Libéré, 14.9.1954" et "Michel Carrouges : 'Les apparitions de Martiens' éd. Fayard, 1963, p. 86,87" et "Aimé MICHEL : 'Apropos des Soucoupes Volantes', éd. PLANETE, 1966, p. 47, 48". Near Acheux-en-Amiénois (Somme), Emile Renard, a 27 year-old mason, and Yves de Guillerrez, his assistant - both regarded as reliable people - see a gray object resembling a truncated kilometric milestone with a large plate resting on its top, from the road where they work. The object, approximately 10 meters in diameter and 3 meters in height, oscillates slowly in lift like a helicopter above the ground, without it never touches. It does not emit light, and seems to have a door on its side. After the men ran up to 50 meters close to it, it flies away without noise, leaving a trail of smoke escaping from a small conduit. After an oblique flight of about fifteen meters, the object rises vertically, and disappears. The witnesses observed the object during at least 3 minutes. The police forces found no traces. (Le Parisien Libéré, September 14, 1954). 1954 - Between Harponville and Contay, France two bricklayers, Emile Renard, age 27, and Yves DeGillerboz, age 23, saw a bluish-gray object floating in midair over a field. "It looked like an unfinished haystack, with a plate turned upside down on top of it." When they tried to approach it took off. It had a diameter of ten meters (33 feet), and they noticed it had a kind of door. The observation lasted over three minutes, at which point the object released some smoke as it departed straight up. (Sources: Le Figaro, September 9, 1954; Aime Michel, Flying Saucers and the Straight Line Mystery, p. 35; Jacques Vallee, Passport to Magonia, pp. 208-209). 00:15 Between Harponville and Contay, Close to Acheux-en-Amiénois (Somme), Emile Renard (mason, 27 years old) and Yves Degillerboz (or Guillerrez?) (his assistant brick-maker, 23 years old) - all 2 looked as reliable people - see from the road where they work 1 gray phenomenon of 10 m in diameter and and 3 m high float in the air above a field resembling a truncated milestone with a great plate resting above: It resembled an unfinished haystack, with a plate turned upside down at the top. The phenomenon oscillates slowly in lift like a helicopter above the ground, without never touching it. It does not emit a light, and seems to have a door on its side. A kind of door is visible. After the men ran up to 50 m of it, it flies away without noise, releasing smoke leaving a trail of smoke escape from a small pipe. After an oblique flight of about fifteen meters, the object rises vertically, and disappears. The witnesses observed the object during at least 3 mn. The police force will not find traces. 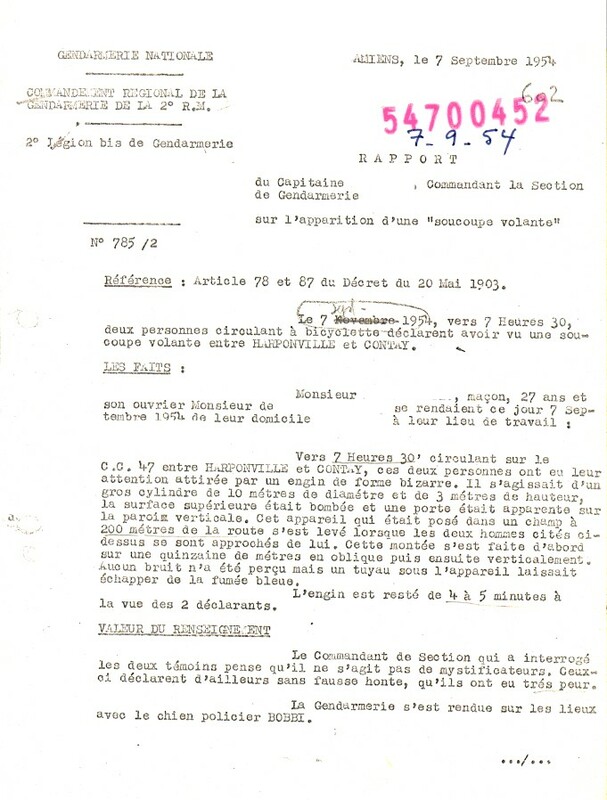 Luc Chastan indicates in his database that in the Somme in Vadencourt on September 7 at 07:15 heures "On the road between Harponville and Contay, two masons going to their work observe an object within two hundred meters of the road. It will be described as a disc like a grinding stone. A turned over Plate of ten meters in diameter oscillating around a secondary axis. On his wall one could distinguish a kind of closed door broader than high. The apparatus rises in diagonal, a smoke escaping from a kind of pipe placed in its lower part. When at about fifteen meter in height, the object continues its vertical rise more quickly and dissapears. It should be noted that contrary to the assertions of the press of the time, it seems that no gendarmerie squad investigated on this case." The sources are indicated: "Ovni, Premier dossier complet... by Figuet M./ Ruchon J.L. ** Alain Lefeuvre pub. 1979". The website indicates that on 7 September 1954 at 07:15 between Contay and Harponville, Contay, France, "Bluish-gray haystack, oscillating, 200 yards away in field. Traveled diagonally upward for 50', then shot straight up. A flying disc was observed. It moved with a falling-leaf motion. It departed by rapidly flying straight up until lost to sight." And: "One blue domed disc, about 40 feet across, around 500 feet away, was observed by two male witnesses, typical age 27, in a field for over three minutes (Renard). No sound was heard." The sources are indicated as Michel, Aime, Flying Saucers and the Straight-Line Mystery, S. G. Phillips, New York, 1958; Project Bluebook, (USAF) Blue Book files counted in official statistics; Bowen, Charles, The Humanoids: FSR Special Edition No. 1, FSR, London, 1966; Vallee, Jacques, Computerized Catalog (N = 3073); Vallee, Jacques, Challenge to Science: The UFO Enigma, Henry Regnery, Chicago, 1966; Vallee, Jacques, Preliminary Catalog (N = 500), (in JVallee01); Vallee, Jacques, Anatomy of a Phenomenon, Henry Regnery, Chicago, 1965; Vallee, Jacques, A Century of Landings (N = 923), (in JVallee04), Chicago, 1969; Schoenherr, Luis, Computerized Catalog (N = 3173); Rogerson, Peter, World-Wide Catalog of Type 1 Reports; Olsen, Thomas M., The Reference for Outstanding UFO Sighting Reports, UFOIRC, Riderwood, 1966; Newspaper Clippings; Hatch, Larry, *U* computer database, Author, Redwood City, 2002. The website indicates that on 7 September 1954 at 07:15 in Harponville, France, "An object floating in mid-air over a field "like an unfinished haystack, with a plate turned upside down on top of it"
And: "Between Harponville and Contay, France two bricklayers, Emile Renard, age 27, and Yves DeGillerboz, age 23, saw a bluish-gray object floating in midair over a field. "It looked like an unfinished haystack, with a plate turned upside down on top of it." When they tried to approach it took off. It had a diameter of ten meters (33 feet), and they noticed it had a kind of door. The observation lasted over three minutes, at which point the object released some smoke as it departed straight up." And: "Between Harponville and Contay, two bricklayers, Emile Renard, 27, and Yves Degillerboz, 23 saw an object floating in mid-air over a field: "It looked like an unfinished haystack, with a plate turned upside down on top of it." When they approached, it took off. Diameter ten meters, height three meters. A kind of door was noticed. The observation lasted over three minutes. The object released smoke when it departed." And: "One object, about 1000 feet across, was observed by two male witnesses, typical age 27." The sources are indicated as Guieu, Jimmy, Flying Saucers Come from Another World, Citadel, New York, 1956. The websote indicates that on 8 August 1954 in "Acheux-Amienois", France, "An object was sighted that had an appearance and performance beyond the capability of known earthly aircraft. One object was observed by two male witnesses (Renaud)." *Sep. 7, 1954 - Between Harponville and Contay, Somme department, France two bricklayers, Emile Renard, age 27, and Yves DeGillerboz, age 23, saw a bluish-gray object floating in midair over a field at 7:15 a.m. "It looked like an unfinished haystack, with a plate turned upside down on top of it." When they tried to approach it took off. It had a diameter of ten meters (33 feet), and they noticed it had a kind of door. The observation lasted over three minutes, at which point the object released some smoke as it departed straight up. (Sources: Le Figaro, September 9, 1954; Aime Michel, Flying Saucers and the Straight Line Mystery, p. 35; Jacques Vallee, Passport to Magonia, pp. 208-209). Summary: Between Harponville and Contay, two bricklayers, Emile Renard, 27, and Yves Degillerboz, 23 saw an object floating in mid-air over a field: “It looked like an unfinished haystack, with a plate turned upside down on top of it.” When they approached, it took off. Diameter 10 m, height 3 m. A kind of door was noticed. The observation lasted over 3 min. The object released smoke when it departed. Summary: Observations of a circular object on the ground with a movement of oscillation. Silent takeoff in oblique then vertical while letting escape a smoke; no trace on the ground: unidentified strange phenomenon. On September 7, 1954, at approcimately 7:30 a.m. two witnesses go to their work by bicycle on the communal way 47 between Harponville (80) and Contay (80). The weather is clear and without fog. They observe on the ground in a field within 200m of the road, a circular form with an oscillatory movement. The two witnesses describe a cylinder of dark color slightly convex on the upper surface and with an opening on the lathe. Intrigued, the witnesses approach to a hundred meters and see the object rising without noise in oblique on about fifteen meters then to the vertical. During the rise the witnesses notice blue gray smoke escaping from a pipe. The observation lasted between 4 and 5 minutes before the phenomenon disappeared in the sky. The frightened witnesses leave immediately to go to the gendarmerie. The same day, the investigation do not note any trace on the ground in the field. One of the witness having already seen helicopters, he affirms that it is not such an apparatus. No other testimony is collected. The credibility of the witnesses is not in doubt. GEIPAN classes this case D1: strange unidentified phenomenon. [---] Indicates sources that I have not yet seen. 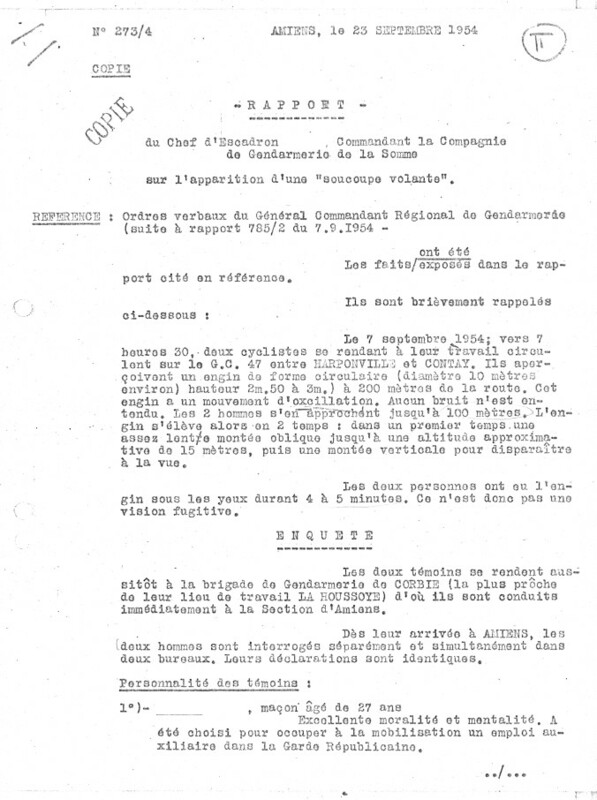 [ge1] Documents of the Gendarmerie Nationale, September 7, 1954 - published by GEIPAN about 2014. [---] Article in the regional newspaper Le Courrier Picard, France, September 8, 1954. [nm1] Article in the regional newspaper Le Nouveau Nord-Maritime, Dunkerque, France, September 9, 1954. 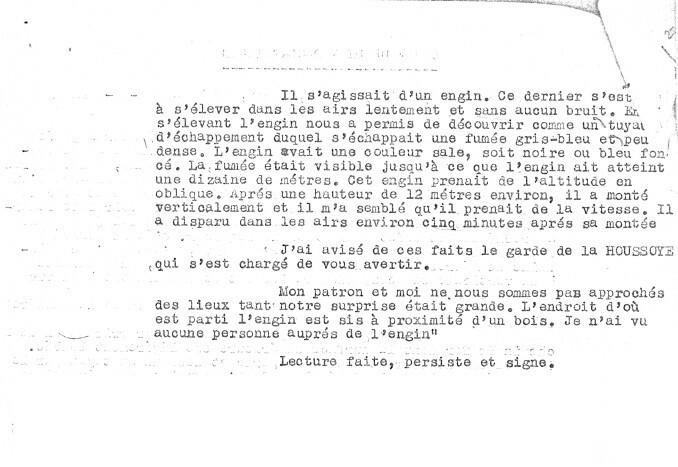 [ji1] Article in an unidentified newspaper, France, September 9, 1954. [---] Article in the regional newspaper La Voix du Nord, France, September 9, 1954. [---] Article in the regional newspaper La Montagne, Clermont-Ferrand, France, September, 1954. [---] Article in the national newspaper Le Figaro, Paris, France, September 9, 1954. [---] Article in the national newspaper Nice-Matin, Nice, France, September 9, 1954. [---] Article in the national newspaper Le Parisien Libéré, Paris, France, page 7, September 9, 1954. [---] Article in the national newspaper Paris-Presse, Paris, France, September 9, 1954. [---] Article in the national newspaper France-Soir, Paris, France, September 9, 1954. [fa1] Article in the foreign newspaper Feuille d'Avis, Neuchatel, Switzerland, September 10, 1954. [---] Article in the newspaper Paris-Dakar, Algiers, Algeria, September 10, 1954. [---] Article in the national newspaper Le Parisien Libéré, Paris, France, September 14, 1954. 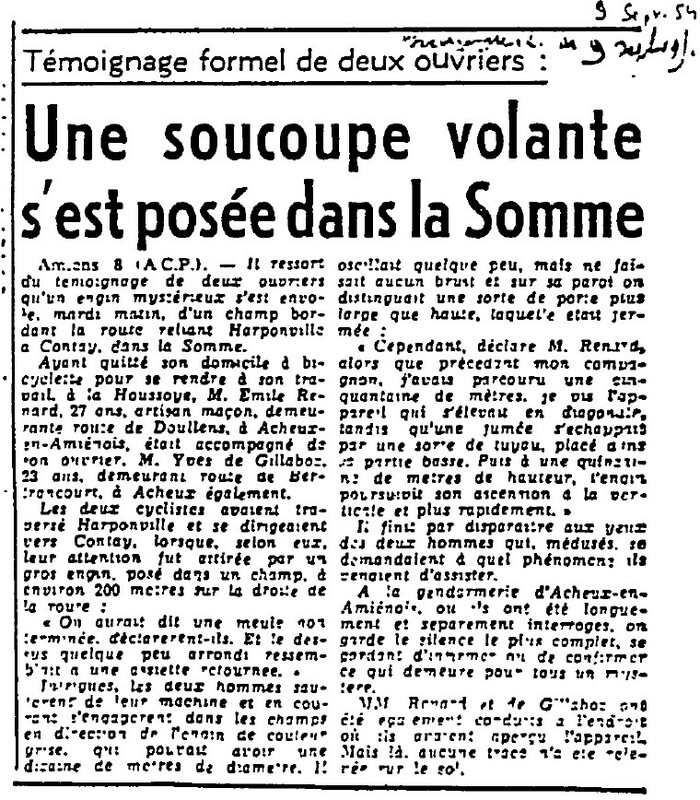 [vm1] Article in the regional newspaper Var-Matin - République, Toulon, France, September 15, 1954. [ra1] Article in Radar magazine, Paris, September 26, 1954. [hw1] ""Flying Saucers Uncensored", book by Harold T. Wilkins, Pyramid Books publisher, U-K., page 54, 1954. [---] "Flying Saucers in Europe", article by Aimé Michel, in Fate magazine, USA, Volume II, #1, page 33, January 1958. [am1] "", book by Aimé Michel, English version of "Mystérieux Objets Célestes", S.G. Phillips publisher, USA, 1958. [mc1] "Les Apparitions De Martiens", book by Michel Carrouges (aka Louis Couturier), Fayard publisher, France, pp. 80, 86-88, 1963. [jv4] "Anatomy of a Phenomenon", book by Jacques Vallee, Henry Regnery publisher, USA, 1965. [jv4] "Anatomy of a Phenomenon", book by Jacques Vallee, Neville Spearman publishers, U-K., 1966. [---] "The Reference for Outstanding UFO Sighting Reports", book by Thomas Olsen, UFOIRC, USA, 1966. [jv2] "Un Siècle d'Atterrissages", article by Jacques Vallée, in the ufology magazine Lumières Dans la Nuit, (LDLN), France, #101, page 8, August 1969. [jg1] "Black Out Sur les Soucoupes Volantes", book by Jimmy Guieu, Omnium Littéraire publisher, France, page 79, 1972. [jg2] "Black-Out Sur Les Soucoupes Volantes", book by Jimmy Guieu, Omnium Littéraire éditeur, France, pp 123-124, 1972. [jv3] "Chronique Des Apparitions Extra-terrestres", French translation of "Passport to Magonia", book by Jacques Vallée, J'Ai Lu publisher, France, pp 257-258, 1972. [jv4] "Anatomy of a Phenomenon", book by Jacques Vallee, Tandem publishers, U-K., page 68, 1974. [jv1] Summary by Jacques Vallée in "En Quête Des Humanoïdes", book by Charles Bowen, French translation of "The Humanoids", J'ai Lu publisher, France, pp 35-36, 1974. [gl1] "Face Aux Extraterrestres", book by Charles Garreau and Raymond Lavier, Delarge publisher, J'ai Lu, France, pp 195-197, 1975. [am1] "Mystérieux Objets Célestes", book by Aimé Michel, Seghers publisher, France, pp. 49-51, 1977. [jv3] "Catalogue préliminaire de 500 observations", by Jacques and Janine Vallée, in their book "Les Phénomènes Insolites de l'Espace", Robert Laffont publisher, France, page 248, 1979. [---] "Le Passé Défini. III. 1954", Jean Cocteau diary edited and commented by Pierre Chanel, Gallimard publisher, France, 1989. [lg1] "UFOs: A History - 1954 - September", monography by Loren E. Gross, USA, pp 9-10, 1991. [uw1] Ufoweb website, France, circa 2002, at www.ufoweb-france.com. [jb1] RR0 website, by Jérôme Beau, France, circa 2002, at www.rr0.org. [dj1] "Alien Encounters On This Day", web page by Donald A. Johnson, Ph.D., compiled from the UFOCAT 2003 computer database, USA, www.ufocat.com. 1.0 Patrick Gross January 4, 2010 Conversion from HTML to XHTML Strict. First formal version. Additions [go1], [jb2], [lc1], [ud1], [ud2], [ud3]. 1.2 Patrick Gross March 12, 2010 Addition [jg2]. 1.3 Patrick Gross June 16, 2010 Addition [dc1]. 1.4 Patrick Gross July 14, 2010 Additions [jv1], [li1]. 1.5 Patrick Gross October 19, 2014 Additions [ni1], [ta1]. 1.6 Patrick Gross October 12, 2016 Addition [fa1]. 1.7 Patrick Gross December 7, 2016 Additions [ge1], [ji1], [ld3], [lg1], [ub1], [ge2]. 1.8 Patrick Gross December 21, 2016 Addition [jv3].